A concert in Las Vegas. Fifty eight dead. Eight hundred and fifty one injured. A church in Sutherland Springs, Texas. Twenty six dead. Twenty injured. A high school in Parkland, Florida. Seventeen dead. Seventeen wounded. Sadly, mass shootings are becoming commonplace in our country. Each shooting pours gasoline on a raging debate. With each shooting, Facebook goes into a frenzy. We are a country divided when it comes to gun control and the Second Amendment. Sadly, the debate often devolves into yelling, name-calling and manipulative arguments. The angry divide in our country over gun control saddens me. It saddens me, because deep down we all basically agree with each other. Yep. That’s right. 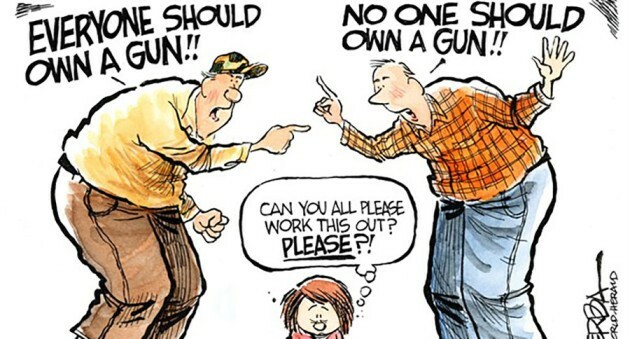 As Americans, we all basically agree when it comes to gun control. We all agree that we want to protect the children in our schools from disturbed classmates who want to harm them. We all agree that we want to protect people attending church and concerts from madmen with automatic weapons. We all agree that we want to protect the clerk at 7-Eleven from the meth-head with a gun. We all agree that we need to protect ourselves and others from bad people with guns. We just disagree on how best to do that. Some say we should limit the guns and make it harder for the bad guys to get them. Others say we should arm ourselves, our teachers and the clerk at the 7-Eleven. Intelligent, God-fearing people fall on both sides of the argument. As Christians, we need to understand and humbly accept that the Bible is silent on this issue. God does want us protecting human life, but nowhere in the Bible does he command or forbid the arming of individual citizens with guns. In our Christian freedom, we can honestly disagree. God does, however, tell us in the Bible how we should treat and speak to each other. He wants us to speak lovingly and respectfully to and about other people. Just because somebody disagrees with you on gun control, that doesn’t give you the right to call them names or mock them. Just because somebody disagrees with you, that doesn’t make them evil or stupid. The overwhelming majority of those who are in favor of a citizen’s right to bear firearms are not inbred, redneck Nazis who want to overthrow the government and shoot all vermin and hipsters with manbuns. The overwhelming majority of those who are in favor of stricter gun control are not crybaby, pompous liberals who have no idea how the real world works. The people who disagree with you on gun control are not evil. Just because they disagree with you doesn’t make them stupid. In the end, we all want the same thing. We want to protect our children. We want to protect that clerk at 7-Eleven. As Christians, let’s stand up and show our world how to disagree respectfully. Let’s stop the name-calling. Let’s stop treating those who disagree with us on this issue as stupid or evil. One of the defining characteristics God wants in all Christians is humility. Understand that maybe, just maybe, your opinion might not be the best solution or best way to protect people from madmen with guns. Please excuse the pun, but there probably is no silver bullet which will solve the gun violence problem in our country. Intelligent, God-fearing people can disagree on this. May God help each of us as individual Christians to speak out and vote our opinions on this important issue. We live in a dangerous world. Lives are at stake. Speak out, but do so humbly, respectfully and in love. Because, in the end, we all actually agree. Lord help me: to “be able to disagree, but not to degrade the other person”.